When our clothes are threadbare and no longer spark joy, it may be time to clear them from your closet. Donating your clothes is a great first step to reduce the waste of your wardrobe. The U.S. Environmental Protection Agency estimates that Americans recycle 15 percent of discarded textiles. This leaves more than 13 million tons of tossed textiles in landfills, which make up an estimated 9 percent of total landfill waste. But when clothes are stained, misshapen and worn, nobody wants to buy them. Luckily, there are recycling programs to give new life to clothes that are not rewearable. Big retailers such as H&M have started recycling programs in attempts to counteract the waste accumulated from fast fashion. Goodwill recycles used clothes that are not re-sellable. 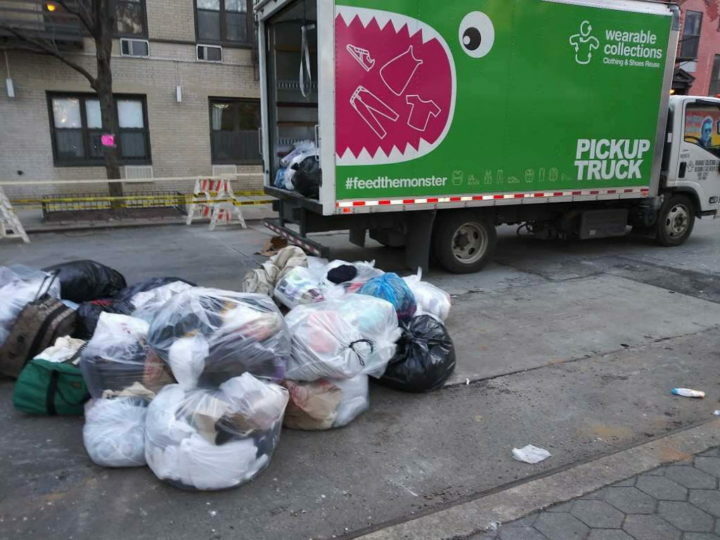 Along with the big retailers and organizations like Goodwill, many cities will have large containers or pop-up collection sites where you can leave your unwanted textiles and other clothing items such as shoes. 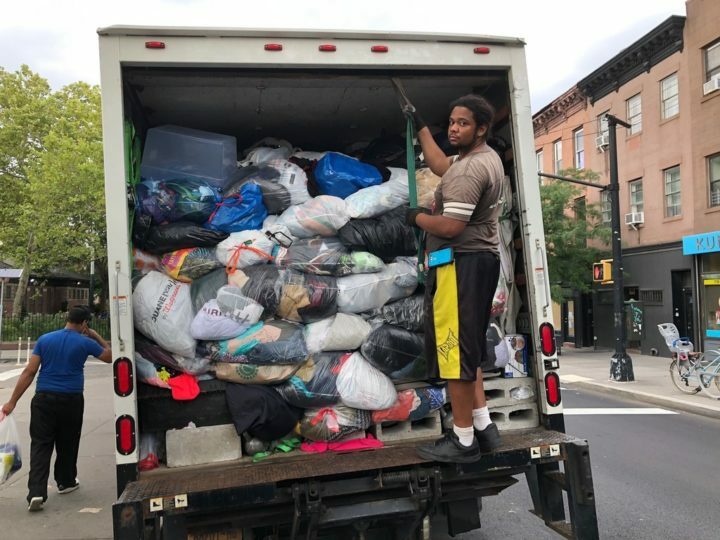 Donated clothing in a truck. “For any bag you collect, 50 percent is going to be wearable and 50 percent is going to be used for other purposes,” said Adam Baruchowitz, founder of Wearable Collections, a nonprofit based in Brooklyn, New York, that runs clothing collection hubs throughout the city. Discarded clothing waiting for pick-up. Even if the fabrics do not go toward new clothes, recycling clothes can keep them out of the landfill. There are some restrictions to what materials can be recycled. Baruchowitz and Lazarev both said that Spandex, Lycra and other materials are difficult to process. “When elastic and rubber mixed in with the textile material, we don’t have a way to separate it,” Lazarev said. 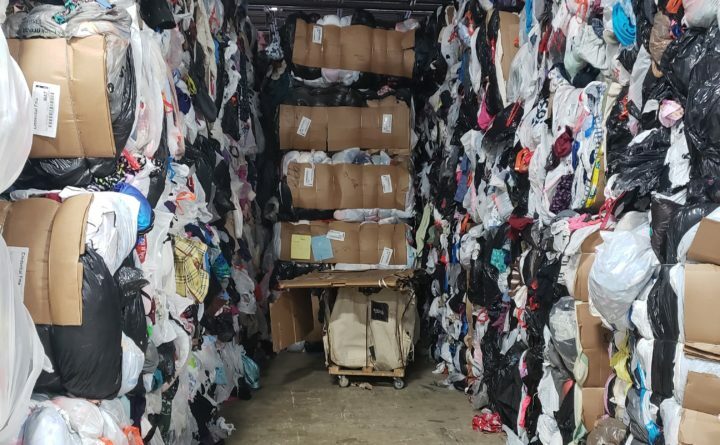 This is especially concerning considering that clothing blended with elastic is becoming more and more popular, but Baruchowitz said new technologies are working toward improving the sorting and recycling process. “We’re waiting on a technological breakthrough,” he said. When it comes to finding a place to recycle your old clothes, you can bring your textiles to Goodwill, or you can drop them off at one of the retailers that have recycling programs, including H&M, Levi’s and The North Face. Check online for any in-store specifications. Madewell, for example, recycles jeans specifically to be used as insulation in houses built with Habitat for Humanity. You can also seek out an organization such as Green Tree Textile Recycling or Wearable Collections in your area. If you are looking for a little more guidance, consult with your local government. “The municipalities will often have a list of companies around the area,” Lazarev said.